(Nanowerk News) For more than 50 years, scientists have debated what turns particular oxide insulators, in which electrons barely move, into metals, in which electrons flow freely. Some scientists sided with Nobel Prize-winning physicist Nevill Mott in thinking direct interactions between electrons were the key. Others believed, as did physicist Rudolf Peierls, that atomic vibrations and distortions trumped all. Now, a team led by the Department of Energy's Oak Ridge National Laboratory has made an important advancement in understanding a classic transition-metal oxide, vanadium dioxide, by quantifying the thermodynamic forces driving the transformation. The results are published in the Nov. 10 advance online issue of Nature ("Metallization of vanadium dioxide driven by large phonon entropy"). "We proved that phonons--the vibrations of the atoms--provide the driving force that stabilizes the metal phase when the material is heated," said John Budai, who co-led the study with Jiawang Hong, a colleague in ORNL's Materials Science and Technology Division. Hong added, "This insight into how lattice vibrations can control phase stability in transition-metal oxides is needed to improve the performance of many multifunctional materials, including colossal magnetoresistors, superconductors and ferroelectrics." Today vanadium dioxide improves recording and storage media, strengthens structural alloys, and colors synthetic jewels. Tomorrow it may find its way into nanoscale actuators for switches, optical shutters that turn opaque on satellites to thwart intruding signals, and field-effect transistors to manipulate electronics in semiconductors and spintronics in devices that manipulate magnetic spin. The next application we see may be energy-efficient "smart windows" coated with vanadium dioxide peppered with an impurity to control the transmission of heat and light. On cool days, windows would be transparent insulators that let in heat. On warm days, they would turn shiny and reflect the outside heat. Materials are stabilized by a competition between internal energy and entropy (a measure of disorder that increases with temperature). While Mott and Peierls focused on energy, the ORNL-led team focused on the entropy. Before the ORNL-led experiments, scientists knew the total amount of heat absorbed during vanadium dioxide's transition from insulator to metal. But they didn't know how much entropy was due to electrons and how much was due to atomic vibrations. "This is the first complete description of thermodynamic forces controlling this archetypical metal-insulator transition," said Budai. The team's current accomplishment was made possible by a novel combination of X-ray and neutron scattering tools, developed within the decade, that enabled lattice dynamics measurements and a calculation technique that Olle Hellman of Linköping University in Sweden recently developed to capture anharmonicity (a measure of nonlinearity in bond forces between atoms). It's especially important that the calculations, performed by Hong, agree well with experiments because they can now be used to make new predictions for other materials. The ORNL team came up with the idea to measure "incoherent" neutron scattering (each atom scatters independently) at ORNL's Spallation Neutron Source (SNS) to determine the phonon spectra at many temperatures, and to measure coherent inelastic and diffuse X-ray scattering at Argonne National Laboratory's Advanced Photon Source (APS) to probe collective vibrations in pristine crystals. Neutron measurements were enabled by the SNS's large neutron flux, and X-ray measurements benefited from the high-resolution enabled by the high APS brightness. SNS and APS are DOE Office of Science User Facilities. Among ORNL collaborators, Robert McQueeney made preliminary X-ray measurements and Lynn Boatner grew crystals for the experiment. Eliot Specht mapped phonon dispersions with diffuse X-ray scattering. Michael Manley and Olivier Delaire determined the phonon spectra using inelastic neutron scattering. Postdoctoral researcher Chen Li helped make experimental measurements and provided neutron expertise. Douglas Abernathy provided expertise with experimental beam lines, as did Argonne's Ayman Said, Bogdan Leu and Jonathan Tischler. 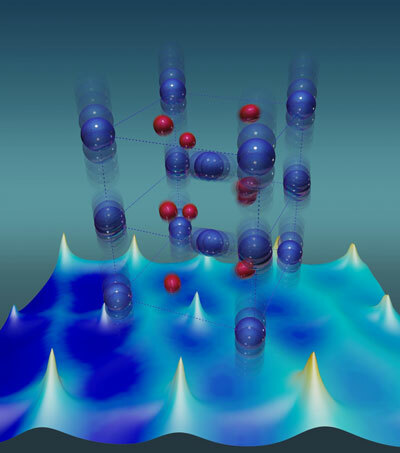 Their measurements revealed that phonons with unusually large atomic vibrations and strong anharmonicity are responsible for about two-thirds of the total heat that each atom transfers during the lattice's transition to a metallic phase. "The entropy of the lattice vibrations competes against and overcomes the electronic energy, and that's why the metallic phase is stabilized at high temperatures in vanadium dioxide," Budai summed up. "Using comprehensive measurements and new calculations, we're the first to close this gap and present convincing arguments for the dominant influence of low-energy, strongly anharmonic phonons." The findings reveal that the vanadium-dioxide lattice is anharmonic in the metal state. Think of atoms connected by bonds in a lattice as masses connected by springs. Pull on a mass and let go; it bounces. If the force is proportional to the distance a mass is pulled, the interaction is harmonic. Vanadium dioxide's anharmonicity greatly complicates the way the lattice wiggles upon heating. "A material that only had harmonic connections between atoms would have no thermal expansion; if you heat it up, it would stay the same size," said Budai. Most materials, it turns out, are somewhat anharmonic. Metals, for example, expand when heated. When heated to 340 kelvin (just above room temperature), vanadium dioxide turns from insulator to metal. Below 340 K, its lowest-energy lattice configuration is akin to a leaning cardboard box. Above 340 K, where entropy due to phonon vibrations dominates, its preferred state has all bond angles at 90 degrees. The phase change is fully reversible, so cooling a metal below the transition temperature reverts it to an insulator, and heating it past this point turns it metallic. In metallic vanadium dioxide, each vanadium atom has one electron that is free to roam. In contrast, in insulating vanadium dioxide, that electron gets trapped in a chemical bond that forms vanadium dimers. "For understanding the atomic mechanisms, we needed theory," Budai said. That's where Hong, a theorist at ORNL's Center for Accelerating Materials Modeling, made critical contributions with quantum molecular dynamics calculations. He ran large-scale simulations at the National Energy Research Scientific Computing Center, a DOE Office of Science User Facility at Lawrence Berkeley National Laboratory, using 1 million computing-core hours to simulate the lattice dynamics of metal and insulator phases of vanadium dioxide. All three types of experiments agreed well with Hong's simulations. In addition, his calculation further reveals how phonon and electron contributions compete in the different phases. "The theory not only provides us deep understanding of the experimental observations and reveals fundamental principles behind them," said Hong, "but also gives us predictive modeling, which will accelerate fundamental and technological innovation by giving efficient strategies to design new materials with remarkable properties." Many other materials besides vanadium dioxide show a metal-to-insulator transition; however, the detailed role of lattice vibrations in controlling phase stability remains largely unknown. In future studies of other transition metal oxides, the researchers will continue to investigate the impact of anharmonic phonons on physical properties such as electrical conductivity and thermal transport. This fundamental research will help guide the development of improved energy-efficient materials.